Alt Text: Some other studio should do the Antz/A Bug's Life thing and release The Dingbats Movie at the same time. I'm reminded of qntm's response to the movie. "Oh Lord, imagine the slash fiction, by which I mean the ＼⧹⧵\|/⁄∕／ fiction". For some reason, I'm getting extreme deja vu on this comic. No, I'm not thinking of 1813: Vomiting Emoji, nor 1726, nor the rest. Ümlaut would, of course, be the villain's ruthless German henchman. I imagine a whodunit where DEGREE_SIGN turns out to have been given a false alibi by his accomplice, MASCULINE_ORDINAL_INDICATOR. 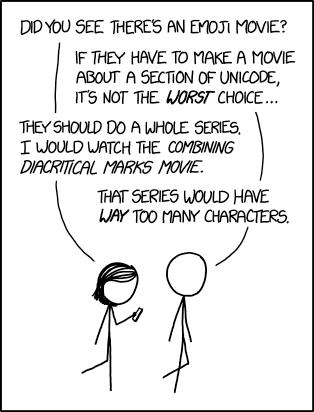 I wonder how well a short documentary on the attempt to get Klingon encoded in Unicode would work? Did anybody else hear a ~rimshot~ after Cueball's last line? Sure, lots of characters, but they'd all be bit parts. Fun fact: the German word "Umlaut" does not contain a single umlaut. Now I'm gonna type it anyway, just for the heck of it: Ümläüt. I really like the pun. svenman wrote: Fun fact: the German word "Umlaut" does not contain a single umlaut. And "eszett" or "scharfes S" as names for ß don't contain ß either. Speaking of series, I always wanted The Matrix to be followed by such films as The Vector, The Determinant, The Jacobian, and The Gaussian Elimination. Well, from a nation with a mostly unadorned alphabet (a № of naïve encyclopædic fœcundities of archæa, aside), I shall add that "aitch" only has an "h" as part of a digraph that is a non-h-ish phoneme. mfb wrote: And "eszett" or "scharfes S" as names for ß don't contain ß either. Speaking of ß, just yesterday, they accepted ß's big brother, formerly known from the Eastern German bootleg version, into Unicode Cinematic Universe canon: https://en.wikipedia.org/wiki/Capital_%E1%BA%9E. To be fair, H is a character, not a phoneme. Being a part of ch / tee-long-ess-in-brackets is definitely a part of its job. gson wrote: Speaking of series, I always wanted The Matrix to be followed by such films as The Vector, The Determinant, The Jacobian, and The Gaussian Elimination. I always thought "The Trace" and "The Determinant" would be apt titles for the sequels. In which the hero takes on the dreaded Eigenvalue! I was never under the impression that the spelled-out versions of the names English speakers use for letters were official anyway. You just learn how to pronounce their names and keep writing them as single capital letters. It's funny how a language so far removed from Latin would evolve (if UK to US English can be considered evolution) into the only living language that doesn't officially contain more than the 26 basic letters of the Roman alphabet. I'm not counting transliterations of languages like Chinese and Hawaiian. W, V, and J would like to have a word with you. "... but in Latin 'Jehovah' starts with an I." Steve the Pocket wrote: It's funny how a language so far removed from Latin would evolve (if UK to US English can be considered evolution) into the only living language that doesn't officially contain more than the 26 basic letters of the Roman alphabet. Most theatres here on Italy number rows with letters. It's funny to see how "j", "k", "w", "x" and "y" are skipped. Sure, this letters are used on loanwords and foreign names (plus on certain regional variants from where some well known surnames originates), but are not part of the "official" alphabet. Soupspoon wrote: For some reason, I'm getting extreme deja vu on this comic. No, I'm not thinking of 1813: Vomiting Emoji, nor 1726, nor the rest. Same here... was it one of those that popped up for a short time on the front page and were then replaced? you know, when you write something like this, we Germans start to warp our tongues trying to pronounce it? ... is Int pronounced Skeeter? I'm going to pronounce it Skeeter. That's exactly what made typing it so much fun. 1. I have a colleague who will not accept, despite all evidence to the contrary, that "umlaut" can cromulently refer to the diacritical mark, maintaining that it can only refer to the linguistic phenomenon (the change in pronunciation indicated by the diacritic). 3. We were told that the mark was properly a pair of short vertical lines, not a pair of dots (i.e. not a diaeresis). Is that really how Germans hand-write them? Looking back I suspect it was to make the mark unambiguous for marking purposes - so you couldn't claim later that you'd written an umlaut but the pen hadn't worked, or, conversely that the apparent dots were just where a bit of ink had dropped on the page. I think my problem with German was probably more to do with my teacher, who I didn't like at all. If there was misbehaviour in class and she wanted to threaten us, she'd warn us that, should it continue, we'd get a lesson on the Pluperfect Subjunctive. Nerd that I was, I would have relished the chance to learn some interesting new grammar, rather than spend yet another double period asking the way to different places and ordering vegetables. And saying "Mein Lieblingsgrüppe ist Cat Stevens" (the textbook was already a couple of decades old). orthogon wrote: 3. We were told that the mark was properly a pair of short vertical lines, not a pair of dots (i.e. not a diaeresis). Is that really how Germans hand-write them? Looking back I suspect it was to make the mark unambiguous for marking purposes - so you couldn't claim later that you'd written an umlaut but the pen hadn't worked, or, conversely that the apparent dots were just where a bit of ink had dropped on the page. That differs in handwriting by inclination, some people also like to replace the two dots with one horizontal bar, is assume for ease of writing, i always use dots and i don't know a font that doesn't. orthogon wrote: I think my problem with German was probably more to do with my teacher, who I didn't like at all. If there was misbehaviour in class and she wanted to threaten us, she'd warn us that, should it continue, we'd get a lesson on the Pluperfect Subjunctive. Nerd that I was, I would have relished the chance to learn some interesting new grammar, rather than spend yet another double period asking the way to different places and ordering vegetables. And saying "Mein Lieblingsgrüppe ist Cat Stevens" (the textbook was already a couple of decades old). Curious, since German has no subjunctive. Also, "Meine Lieblingsgruppe ist Motörhead." "Dein Lieblingssänger ist Yusuf Islam.". Last edited by speising on Mon Jul 03, 2017 3:48 pm UTC, edited 1 time in total. The origin of the two dots was a small Süterlin e above the base letter, which is just two vertical lines. I honestly don't remember how we were taught to write Umlauts in elementary school, but I have seen both (and other variants). Personally, at least with a fountain pen, I prefer using vertical lines, as they are faster to write and less likely to fail. With a pencil, I think I still do a vertical motion, but it is so short that it is basically indistinguishable from a dot most of the time. Some people join the vertical lines with a diagonal to avoid lifting and realigning the pen. speising wrote: That differs in handwriting by inclination, some people also like to replace the two dots with one horizontal bar, is assume for ease of writing, i always use dots and i don't know a font that doesn't. I dislike indicating Umlauts with a horizontal bar, as this diacritic is already overloaded. The vertical bar can indicate a long vowel and is also used in old-fashioned handwritings to differentiate a u from an n.
speising wrote: Curious, since German has no subjunctive. Also, "Meine Lieblingsgruppe is Motörhead." "Dein Lieblingssänger ist Yusuf Islam.". Really? I thought it had two, but as she never followed through on the threat, I never found out. She also taught French, which I'm pretty certain has a pluperfect subjunctive, though I've never knowingly heard it used. I don't recall getting beyond the present tense in two years of studying German. As I say, directions to the train station and vegetables. Actually we didn't even do vegetables - that was French. ("Je voudrais un kilo de pêches"). This talk of subjunctives that either don't exist or are never used reminds me of the other observation I was going to add. I remember watching the middle Three Colours movie (White, presumably). I was amused by the way the Polish protagonist's failure to master the French subjunctive was used as an an analogy for his sexual impotence (or vice versa - I don't really know). At the beginning his partner has a go at him for not being able to perform in bed, and also for his mangling of the French language. He smuggles himself to Poland in a box -- I can't remember why -- and starts using language tapes to improve his French. There's a scene where he's repeating "que je dormasse, que tu dormasse, qu'il dormasse, que nous dormissions, que vous dormissiez, qu'ils dormassent". I never quite worked out what tense it was (imperfect subjunctive?) but the conjugation stuck with me ever since (probably with less than perfect fidelity - and I think there should be circumflexes). Anyway, at the end his partner comes back to him - he says "Je voulais autant que tu viennes," and completes the analogy with a highly successful session in the sack. Really? I thought it had two, but as she never followed through on the threat, I never found out. She also taught French, which I'm pretty certain has a pluperfect subjunctive, though I've never knowingly heard it used. German has two Konjunktiv's, which isn't properly the same. I'm sensitive to that, as i'm in the process of learning Spanish, which has a similar system as French. speising wrote: Also, "Meine Lieblingsgruppe ist Motörhead." "Dein Lieblingssänger ist Yusuf Islam.". The gender reassignment was my bad, but I'm 99% sure it was "Lieblingsgruppe," and it definitely predated his changing his name I suspect that whoever wrote the book didn't realise that Cat Stevens was the guy's name as opposed to the band, or it was written by a native speaker who was laughably out of touch with the kids even at the time, and it was the equivalent of "Who are the Beatles?" and the whole thing translates roughly as "My favourite Popular Beat Combo is Cat Stevens". orthogon wrote: 3. We were told that the mark was properly a pair of short vertical lines, not a pair of dots (i.e. not a diaeresis). Hungarian uses both dots and vertical lines, so you can't fudge it - ö is a different letter than ő, and ü is a different letter than ű.
Ok, right, yes that's a completely different thing. It's what I used to think of as the "conditional", although Pinker says that (in English) we simply use the past tense to convey that factual remoteness; it's just that "would" is the past tense of "will". So "if I have a lot of money, I will travel the world" becomes "if I had a lot of money, I would travel the world". Having seen how it works in German, I'm more sceptical. There's more than a little similarity between "would" and "würde", although the two words don't appear to be cognates. Then again, the way the conditional is formed in French, using the future form with an imperfect ending, seems to make use of this same "future of the past" idea that Pinker talks about. Also French uses the imperfect in the "if" clause of the sentence (I can never remember the technical term), which is analogous to English but different to German. One more thing regarding my "Ümläüt" joke: the "äü" combination flies in the face of German orthography rules and is pretty much unpronouncable within German phonetics. This is the script I was taught in School, which definitely has two short vertical lines to indicate umlauts, although like many others I later switched to dots. speising wrote: Curious, since German has no subjunctive. Apparently, German Konjunktiv is called subjunctive in English. At least it very definitely is on Wikipedia. Aren't those on ő and ű supposed to be short diagonal lines? Some people use a horizontal line instead of the double dots, which my high school literature teacher hated. As far as vertical or slanted, basically, anything goes as long as you don't slant the wrong way. But yes, road signs generally have vertical lines, even though it seems like slanted ones ought to fit better. svenman wrote: One more thing regarding my "Ümläüt" joke: the "äü" combination flies in the face of German orthography rules and is pretty much unpronouncable within German phonetics. It is possible if you treat it as two separate vowels: "Üm-lä-üt". It sounds like a very strange accent then. Thanks, Reka and somitomi - I learned something new about Hungarian (diacritic) accents there. And to designate a double letter in even older handwritings, from the middle ages up to Sütterlin script. My handwriting was pretty ugly from the word go and deteriorated further until I switched to writing in block letters sometime in high school, which then gradually became more cursive (and messy again). I found some articles (including this one from 1943) while searching for the second image, that put the blame entirely on this particular writing system (it is apparently called zsinórírás). And yet this is the writing I had to learn in school a little after the turn of the millenium, so I guess that's Hungary for you.